With a built-in active cooling system,AXIS Q6044-C can operate in temperatures up to75°C (167°F). The dust- and waterproof camera is IP66- and NEMA 4X-rated and meets the tough military standard, MIL-STD-810G, ensuring reliable operation in harsh weather conditions such as sandstorms. In windy conditions, the camera’s electronic image stabilization provides clearer, more useful video and helps reduce the size of video files, which leads to lower bandwidth and storage use. AXIS Q6044-C also supports automatic defog, which, when activated, automatically detects fog in the scene and digitally filters it out of view to provide clearer video. Support for shock detection enables the camera to trigger an alarm if it has been hit. Axis Communications was the first company in the world to launch a network camera in 1996 and is the market leader in network video Solutions.Whether the requirement for Axis Ip cameras in Mumbai India is for a few cameras, or a few thousand, our Axis Ip camera India solutions are easy to install . Axis Communications operates offices in more than 40 countries and employs over 1600 people . 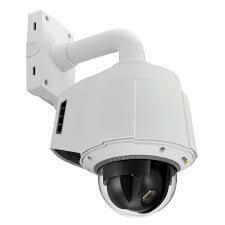 AXIS cameras in India are setting the standards in defence ,retail and manufacturing sectors. The other advantage of Axis cameras is they outlast most of the other cameras currently available and the quality of the image remains crisp and clear over a long period of time. Axis ip cameras work well in different climatic conditions even if you are installing Axis Ip cameras in Mumbai's humid environments or Delhi's hot summer the clarity of axis IP cameras in India is unsurpassed .This is a fast selling camera in Mumbai ,India and a favourite of the Installers as its very economically priced and best suited for Rugged Indian indoor/Outdoor Conditions.